For years, we have been developing websites for clients who finally come back and ask, "Is there a way I can just update the website myself?" Of course, they have no idea what HTML is and how it works, and truly they shouldn't have to know. Why shouldn't they have the ability to modify their site whenever they wish? They own the site, they know what should be on it, and they should have the ability to post their information. The Website Management System (WSMS) is a website content management system designed to allow website owners (who do not have knowledge of HTML) the ability to modify their website at anytime. It is a self contained system that once installed and configured will aid in keeping a website current with up-to-date information. 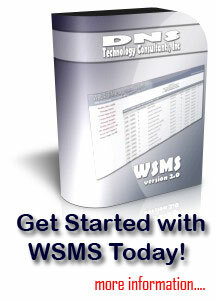 To put it simply, you can log into WSMS and modify your website with ease. You are able to create pages, modify links, add and change content, and many other features. The way it works is you (or your web designer) places code within your webpage where you would like the content to be displayed. After everything is installed, that is it you are ready to go. Establish and modify site wide configurations and defaults. Ajax powered editing features that allow you to make modifications to your website quickly and easily. A built-in Image Manager that allows you to upload and delete images for your site or page. The ability to create users accounts and grant editing access to certain pages. Link editor that will allow you to have site navigation or specific page navigation. Records last modification date on each page when the pages are modified so that you can keep track of what pages have outdated information. Layouts of the website can be modified at anytime without comprising the data contained on the page.